No Charge for cancellations 7 days before arrival. Si no llegan o cancelan después de los 7 días se cobrara el total de la reservaciónn grupal. NO se permite el consumo de drogas, alcohol, cigarrillo dentro del Hostal. Sagú es un lugar trankilo de relajación, deporte. Para los grupos deportivos tenemos gimnasio, que va incluido en la tarifa. Si desean desayuno campesino, demostrativo y cultural, se lo podemos agregar al paquete. Come and stay at one of the most relaxed hostels in costa rica. 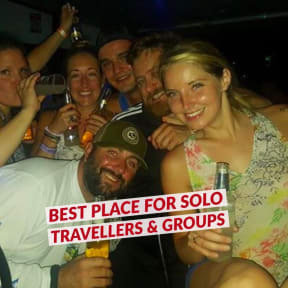 A place where you can come and enjoy one off the wonders of Costa Rica the Arenal Volcano, a hostel in the town of La Fortuna on the main street close to all the shops restaurants and all the major attractions in downtown fortuna. When you walk out the front door and look to your right you will have a picture perfect view of the amazing Arenal Volcano. We are located in one of the best locations of the city, near to some of the best attractions and landmarks of the area such as Arenal Volcano, Arenal Ecolidge Park and La Fortuna Waterfall, amongst other interesting spots and landmarks of our town. We have different accommodation options depending on what the guests and travellers are looking for. In this sense, we have dorms with different capacities as well as private rooms with diverse capacities, all ofthem equipped with all the necessary amenities and servicies. In addition, we have several common areas where the guests and the travellers can get together and exchange past experiences and future plans. The reception is open from 7:00 a,m, to 10:00 p.m.
Michael was the best!! So helpful!!! Sagu hostel is in the perfect location. Only some minutes walking from the bus stop. And from all the bars and shops. The host is super friendly and can provide all kinds of great information because they also run tours etc. Beds are so comfortable and clean, not these slim bunkbeds where you have to squeeze yourself in. Best price in Fortuna and a cool spacious place. I‘d totally recommand it. A great stay but the entire 3 nights my friend and I stayed there wasn’t anyone else staying at this hostel. It didn’t have hostel vibes at all-connected to a gym (which allows access). The guy who ran the hostel was soooo nice, helpful, and welcoming. If you want something quiet, this is the place for you. Cheap. Very basic so if you just want a bed for the night it’s perfect but don’t expect luxury. anyone can walk in; there isn't someone there after ``10 pm. The room I was in had a door that didn't close completely. The gym has loud rhythmic music playing that is distracting in the hostel. The chairs are comfortable, linens clean, floor clean. This is one of the worst hostel I have stayed in my entire life. The kitchen is a joke, everything is dirty, really weird place. You do not wanna cook here. The rooms, you lock it with a padlock, which is weird, but that's the most security you gonna have at this place. Also at the room, you will find an old, full of dust fan, that just blows in one direction. This place just have a weird vibe. All this costs U$15 dollars which is more (or the same) then all the actual good places at La Fortuna. There wasn't proper walls between the rooms, the whole room shook when you closed a door. It was far too hot and the fan provided didn't help it just moved hot air around so the room was a sweat box and we couldn't stand to stay in it longer than we had to. The bathrooms were disgusting and smelled of urine.